If you have a passion for preparing foods and are wondering about how to start a catering business, there are a number of things you'll want to consider as you pull together your business plan. How far in advanced are they booked? Do they have a niche market that competes with your plans? Learning the answers to such questions can help you define the need for caterers within the local market and also how to tap into it the market successfully. The second step to take before you start your catering business is to become familiar with federal and local regulations pertaining to food handling and what must be done to receive a license in your state. Once you start your business, it will be subject to inspections that must meet food handling and safety requirements. Once you have your business plan written and know the direction you want your catering business to take, you can begin to consider the particulars that need definition. Once you've taken the steps to define your business and obtain appropriate licensing it is time to turn your attention to physical items you need to operate and promote your business. If you plan a small in-home business to get started, then you probably won't need to buy much equipment, but if you're thinking bigger, you'll have to find a facility that suits your needs. This facility will have to be approved by the health department, and you'll also need purchase or rent equipment needed for operation. All the previous steps won't matter, if no one knows about your business. A marketing and advertising plan must be drawn up and followed. For a catering business, the Yellow Pages can be a useful avenue to let people know what services you offer. Your ad can be placed under the catering section, but may be more effective if you are more specific, such as "Wedding Caterers." The Internet is also a useful tool. Create a blog to highlight your services. This can include tips on how to hold a successful party, what to look for in a caterer, and other relevant topics. Create a brochure or flyer complete with services you offer and contact information. Leave a supply of these brochures with the businesses you've contacted. You can offer to reciprocate by referring their services to your clients. Another consideration in how to start a catering business is who will help you create the business of your dreams. For smaller businesses family members may be willing to help at the start, but to build a successful business, the people that work with and for you must be dependable and capable. Treat them right. Show them they are appreciated and they will work with pride which will be reflected in the services provided. 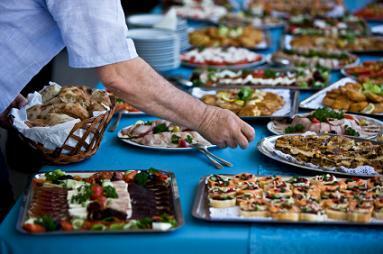 A catering business is more than preparing tasty food people love. Caterers must be capable and dependable. Develop a reputation as a courteous and professional entrepreneur. Return calls in a timely manner. Show up on time and deliver the food and services as promised. If you deliver as promised or more, word of mouth will grow your business.